This is the first of my Ireland theme posts. As I informed you, I went to Ireland with my Dad. Those of you who know him (probably none of you), will know that he most enjoys sitting in either a Pub or a Betting Office. Now I tend to not be too keen, mainly because of the smoke. My eyes hurt, my hair and clothes smell and it’s pretty hard to breath. 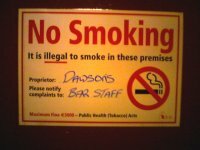 Now Ireland have introduced a ban on Smoking in the Workplace, which covers everything which is enclosed, and therefore includes Pubs and Betting Offices. And WOW, it’s lovely. Where as before I was more pro choice, I’m now pro ban. Vintners’ Federation of Ireland President Seamus O’Donoghue conceded there was a “lifestyle element” in the move away from pubs but the smoking ban had more to do with it. 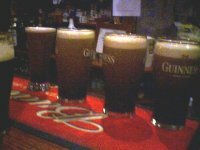 Much of the drop in pub sales had come between May and July after the ban came in, according to the CSO figures which showed the value of pub sales fell 2.4pc in that time and the volume by 4pc. there are other factors, new laws introduced for motoring, now make it illegal to drink and drive and the Garda are really cracking down on this, so rural pubs are being affect by this. However the effect it will have on non-smokers lives is much greater than a small, short-term fall in sales. 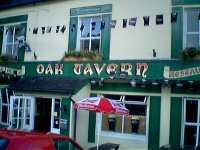 Whilst I’m here talking about Irish Pubs, a couple of other things that I noticed. 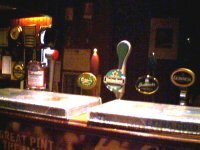 At first I was impressed by the choice the pubs offered, most had at least 6 drinks on tap, then I noticed that almost all of them had just Guinness, Heineken, Budweiser, Carlsberg, Smithwicks & Bulmers, so really not much choice between pubs. All spirits were sold in 35.5ml measures. That pubs closed at 11.30 on weekdays and at 12.30 on Fridays and Saturdays and 11.00 on a Sunday, and that you got 30 minutes drinking up time. and that my Dad’s cousin Joan, can drink lots!